Belfast 32 County Sovereignty Movement: Francie Mackeys address to Ard Fheis 2015. Francie Mackeys address to Ard Fheis 2015. We carry below, the address to the 32 County Sovereignty Movement Ard Fheis 2015, from 32 County Sovereignty Movement, National Chairman, Mr Francie Mackey. When you stand in the shadow of great events your fitness for purpose comes under the spotlight. Republicanism is on the brink. The Irish people, rightly, have no appetite for random militarism. We cannot look upon our youth as jail fodder and we cannot advance our objectives with a tradition of factionalism. For the Irish people the optics which republicanism presents is a meaningless jumble of alphabet soup; a swirling mass of letters and numbers saying absolutely nothing to them. How can we claim to be acting in the national interest of our people when we can’t even present a coherent message to them? For many years the 32 County Sovereignty Movement have advocated unity amongst republicans. Our motives for this have been grounded in a political pragmatism and an honest appraisal of organisational abilities and resources. And without wishing to invoke a worn out metaphor the issue of republican unity has definitely not gone away. The malaise within current republicanism is a self-inflicted absence of comradeship and trust with the added inevitability of manipulation from outside forces. There exists a mindset within republicanism that is prepared to form new entities as opposed to working through existing problems in a mature way. This has to stop. “ What Is Republican Unity? In one sense republican unity is a desire to be politically relevant in a contemporary political sphere and in another sense to be historically true to ensure that republican history is a significant part of that relevance. And in as much as it represents a balance of ideals it must also represent a balance between ideals and practical activity. In political conflict being right and true alone, unfortunately, is not enough. Though any conflict may rest on a singular issue they are generally fought on many fronts. Even though the singular cause may be open to different interpretations the fact remains that within the Irish context republican interpretations all conclude that a conflict nonetheless still exists. And with that being the case those different interpretations must still address the same many fronts upon which it is fought. In other words the initial approach to republican unity should be centred on the inevitable practicalities that any republican view of the conflict must engage if it is serious about securing its objective. It is here that republican unity can be built with republican diversity still intact. The balance between ideals and their practical pursuit is best achieved by realising that the mechanisms we employ to further them are in themselves apolitical. Publicity for example needs a printing press but is better served by two. What prior political agreement is needed before this conclusion is reached? Where is the strategic sense in arguing over what publicity should be aired whilst neglecting the practical mechanism to propagate it? Diversity on a given issue is not the problem but is invariably cited as such. The problem is that republicans fail to co-ordinate on what that given issue should be. Certainly there are issues specific to particular groupings and issues wherein diverse stances are counterproductive but within the spectrum of the conflict these issues are far outweighed by those upon which republicans could agree are worthy of coordinated comment, diverse or not. The veracity of those observations remain true today, even more so in light of the continuing fracturing of the republican base. And we can only stop this rot by sitting down with each other and talking. And from such engagements there needs to evolve a model for republican cooperation, locally and nationally, to move our objectives forward. At this point I would like to send our best wishes to Alan’s brother, Vincent, who was the victim of a vile and criminal assault and hope for his speedy recovery. I also bring to your attention the dark hand which sought to manipulate and exploit this criminal act to ferment violent discord within armed republicanism. Whilst no doubt the full details of this episode will emerge, both in culprits and motive, I now call on all republicans to display discipline and pay no heed to tabloid speculation. The Centenary of the 1916 Easter Rebellion is all but upon us. It will be a defining moment for all republicans because more than anyone else we will be held to account for our claim to be the inheritors of its mantle. I applaud and we fully support the efforts which republicans from various organisations are currently undertaking to ensure that the republican message is not drowned out in the din of revisionist noise. The 32 County Sovereignty Movement are looking forward to standing square with our republican and socialist comrades in this endeavor. For our part we see the Centenary as an opportunity to put in place the model for republican cooperation alluded to earlier. The Proclamation is a unifying document which addresses many issues on a national level. The building of a political movement as a vehicle to advance republican goals is the shared responsibility of all republicans. All constituted republican organisations deserve the equality and respect for their contributions to such a movement. The 32 County Sovereignty Movement is not itself immune from organisational deficits. We do not function as we should. Our organisation and our communications can be patchy and inconsistent. And although each year we pass motions designed to improve our overall structures it remains the responsibility of each individual member, from Ard Chomairle to Cumann level, to fully play their part to ensure that such structures function. 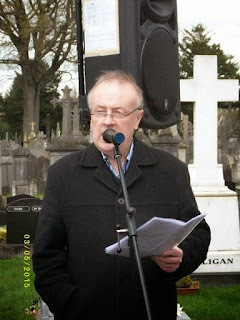 Every Cumann must take responsibility and initiative for local activities. Our activism must be both visible and consistent. We need to make the Sovereign Nation the driving voice for Irish republicanism reflecting our activism on the ground. Irish republicanism has it within its gift to secure our objectives. We have the talent, acumen, history and political insight to accomplish this. We need to do it together.